Aggregate equipment is suffering from falling demand just as many other types of construction machinery. These declines are following industry trends, which can be attributed to a suffering U.S. economy and continue to place pressure on machinery production workers and equipment operators alike. Mining equipment, in particular has seen a sharp decrease in demand, causing Caterpillar to announce the layoff of one third of its aggregate machinery production workforce. The layoffs affect workers in Milwaukee, Wisconsin – which primarily produce electric powered shovels used in large-scale open pit mines. This means an indefinite layoff of approximately 260 workers to begin on June 24th, 2013. Although, the layoffs are not coming as a surprise to aggregate equipment production workers, this will put a hardship on those affected. Workers were notified previously that as many as 40% of the 770 production workers in these plants were at risk of being layed off. While the entire aggregate equipment industry has seen a trend of decreasing machinery sales, the decline in mining equipment demand is to blame for the upcoming layoffs at Caterpillar. Mining equipment demand has dropped significantly in recent months as mines are forced to scale back investing in new equipment due to lowering prices for mined materials such as copper and iron ore.
Caterpillar initially acquired their two Wisconsin equipment assembly plants as a portion of an $8.8 billion purchase of Bucyrus International Inc., a mining equipment manufacturer, in 2011. 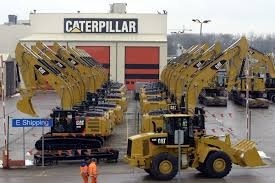 This purchase was largely to thank for a portion of Caterpillar’s profit and sales growth in previous years as mining companies expanded production causing greater demand for equipment purchases.This demand was cut short as mining operations have not expanded at the rate previously expected. The laying off of one third of the aggregate equipment production workforce is a huge deal, but what is in store for the remaining two thirds of the workers? The United Steelworkers Union has come to an agreement with Caterpillar to freeze hourly wages for remaining workers for six years and to lower the pay scale for new hires. Fortunately, Caterpillar also agreed to give annual bonuses based on performance in place of hourly raises. Even employee pensions are affected as they will have a cap and be replaced by a pension plan similar to a 401k. These changes will limit the stress felt by Caterpillar to rising pension costs, which is hoped to save remaining jobs and help prevent future layoffs. Caterpillar is just one major aggregate equipment manufacturer hit hard by a struggling economy. Everyone in this industry and other construction industries, are feeling the squeeze of dropping prices and decreasing demand. However, mining companies are optimistic that there will soon be an upturn in the economy. Hopefully it will relieve many of the hardships faced by this industry including manufacturers of mining and other types of aggregate equipment.